together successfully on community ventures. 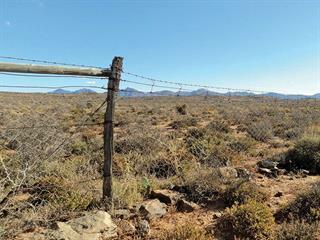 The Koup jackal-proof fence project also involved the repairing of existing fences in the district. The Koup is an arid sheep-farming district in the Laingsburg area of the Karoo, the smallest municipal district in South Africa. The N1 highway cuts through its middle, providing some economic opportunities (accommodation, petrol, and so forth), but mostly it serves as a reminder of how insignificant the town is to the wider economy. In 2009, frustrated by the growing problem of jackal predation in the district, Lukas Botes, chairperson of the local farmers’ association, and Piet Gouws, a sheep farmer, conceived the Koup jackal-proof fence project. A joint venture of 19 farms along the banks of the Dwyka River, it involved enclosing 80 000ha with 238km of jackal-proof fencing (a wire mesh fence with rocks packed at the base), and provided 6 038 days of employment. The success of the project proves that it is possible for government to facilitate and support community-led job creation and empowerment projects that are worthwhile for farmers. This is according to a study of the project by Profs Nicoli Nattrass (Centre for Social Science Research), Beatrice Conradie (School of Economics) and Inge Conradie, (School of Economics and Centre for Social Science Research) from the University of Cape Town (UCT). Government funding covered the costs of labour and wire fencing, and farmers were expected to contribute droppers and lend tractors and trailers to transport rocks for packing along the base of the fence. Up to 30 workers grouped in teams of six were employed. Although managed by farmers, fencing team leaders were drawn from the ranks of the unemployed in the surrounding community. These leaders were responsible for recruitment into the project and for the day-to-day operations. The project provided fences for individual farmers, thereby benefiting them directly, but because it effectively encloses an 80 000ha district, it benefits all farmers in the area. In 2010, Botes and Gouws applied for government assistance to build and repair jackal-proof fencing in the Koup. The pair developed their project after learning of an unsuccessful government-funded area-wide fencing project in Rietbron, east of the Koup, from LandCare head, Francis Steyn, at a predator management workshop in Beaufort West. Their original application, which included contractor-supplied fencing as well as helicopter hunting operations against jackals, was unsuccessful partly because it did not promote community empowerment and job creation. In addition, the farmers’ initial vision of eliminating jackals and creating a sheep reserve was not in keeping with government’s environmental policy, which emphasises sustainable environmental management and protection of wildlife. Botes and Gouws then turned their proposal into an area-wide plan in which the fencing project was reconceptualised as a community-led, job-creation scheme framed as a jackal-control (rather than eradication) effort, as well as a means of facilitating sustainable agricultural livelihoods and wildlife stewardship. According to the UCT study, this strategy remained controversial, with some environmentalists charging that it would undermine biodiversity by restricting animal movement across the landscape. But the farmers countered that, once the jackal population was under control, holes would inevitably be created by porcupines and aardvarks digging under the fences, allowing wild animals to move through the area again. It was also argued that, given the current use of poison and trapping to control jackals, a fence might improve biodiversity. An existing initiative to assist farm workers in the Koup facilitated the transformation of the fencing proposal into an income-creating and empowerment programme. Botes’s wife, Jacolise, had previously conducted research on the social needs of farm workers in the area and had started a non-government organisation called AgriReap, which, among others, runs the Farm Worker of the Year competition in the district. After funding was obtained for the fencing project from government in 2011, AgriReap managed its finances, registering workers with the Unemployment Insurance Fund and assisting them to open bank accounts. Wages were set at the same hourly rate as the legislated minimum wage in agriculture (which is also the minimum wage for government employment projects in the area), with team leaders earning an additional 30%. However, relying on national incentive funding schemes, such as the Expanded Public Works Programme and the department of agriculture’s Comprehensive Agricultural Support Programme (CASP), brought its own challenges. Among others, the state wanted a balance between its objectives and the spread of projects competing for funding. This resulted in severe financial shortfalls. In 2013/2014, for example, the project had to rely on a mere R60 000 for wages and R40 000 for materials from LandCare’s internal project funding (the department’s Equitable Share Programme). As a result, the fencing teams had limited work that year. The fencing project relied heavily on the participation of local farmers, especially those who took on leadership roles. “There are always collective action problems in area-wide initiatives of this kind, but they can be overcome with social incentives (peer pressure exercised through meetings), restricting benefits to contributing members, and by relying on the efforts of dedicated individuals,” says Prof Nattrass. The project had other spin-offs too. A multidisciplinary research project, including socioeconomic surveys of farmers and ecological research comprising, among others, the use of trail cameras and the radio-collaring of predators, was initiated. This generated momentum for further scientific work in the Koup, such as providing subsidised scanning services to farmers to check for pregnant ewes with the aim of quantifying jackal-related stock losses. LandCare also conducted a vegetation assessment to determine the extent to which grazing quality related to problems farmers face. Jobs such as those provided by the fencing project can improve the socioeconomic positions of those fortunate enough to obtain them, especially in the wake of decreasing on-farm employment and the rise in casual employment as a percentage of total employment in agriculture. According to the UCT study, this aspect of the public works programme worked well in part because workers were required to camp on farms for two weeks at a time, and this meant only the most committed were chosen for the job. “[It] shows that national government can be successful in inserting a broader transformation agenda into projects through incentive-based funding, which prioritises community-led projects, and by requiring that government money also be spent on emerging and subsistence farmers,” says Prof Conradie. Source: The African Journal of Agricultural and Resource Economics, Volume 10, Number 2. Email Prof Beatrice Conradie at the School of Economics at UCT, at [email protected].